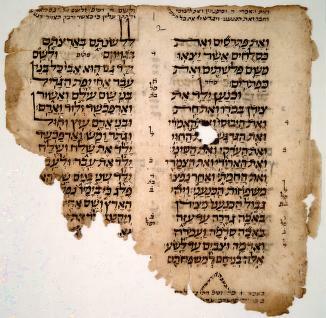 A folio page from a manuscript of the book of Genesis, with Masoretic pointing and marginal notes, from the 10th or 11th Century C.E., found in the Cairo Geniza and now housed at the library of the Center for Advanced Judaic Studies of the University of Pennsylvania. Used with permission. Go to U. Penn Library SCETI for further details.